Back of the Head: And Where Is The Batwoman? Hello. I'm an adult male and I now read Batwoman. What is Batwoman? No, seriously, what is that, you may ask? Obviously, we've all heard of Batman. We all love Batman. We've heard of Batgirl, of course. And Robin, naturally. And Nightwing too, probably even non-comics fans know of him. Batwoman? 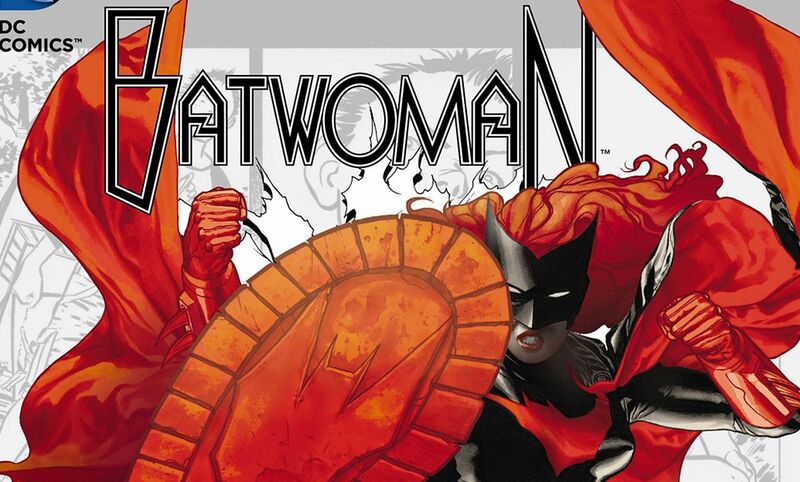 What the hell is the Batwoman? The publishing and character history of Batwoman is long and complicated. It's here if you want to read about it. But it doesn't really matter. What does matter is what Batwoman is today, which is what I regard as perhaps the finest ongoing comic book series currently published by DC Comics, starring its most unique and interesting superhero. It's the best comic book you're not reading. It was the best comic book I wasn't reading until recently. But now that I've read as much Batwoman as I could get my hands on (the collected volumes of "Elegy" - with an introduction written by Rachel Maddow - and "Hydrology", the current run of Batwoman #1-12 in The New 52, and the two comic books numbered as "Batwoman #0", published in 2010 and 2012), I've come back from Gotham City heralding the news: This book is phenomenal. This character is phenomenal. Batwoman is phenomenal. Did you get all that? Have you ever heard of a superhero like that before? I hadn't. You read enough superhero comics, watch enough superhero movies, they all blend together. All origins sound alike. This one is different. Because this heroine, Kate Kane, is very different. She's flawed, headstrong, dedicated, dangerous, sexual, tough, and brave. She's an adult. She's very real. 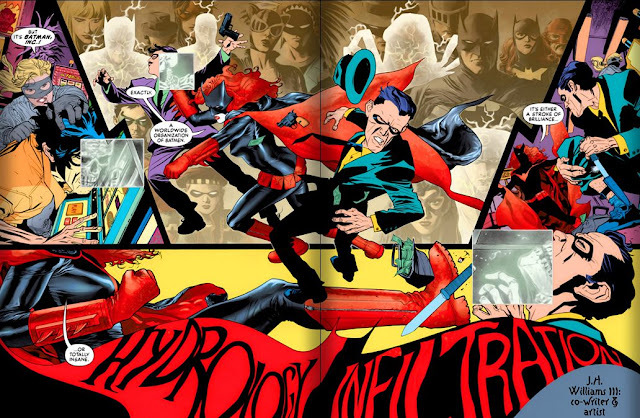 All of the trappings of the superhero are there: tragic past, desire to seek justice, gaudy costume of red and black, the "colors of war" (iconography borrowed, initially without permission, from the Batman). On the surface, Kate Kane is like Bruce Wayne, an heiress to a fortune, posing as a dilettante, but is highly trained, armed with specialized bat-motif weaponry and vehicles. What separates Kate Kane from the Batman, and from the rest of the superhero pack, is who she really is. A lesbian? Sure, she's that and proud of it. That already makes her unique. She was a soldier, and in a way she still is. But what sets Kate Kane, the Batwoman, apart is that she's a survivor. Terrible things happened to her, and continue to, but she endures. She's not a thrill-seeker or out for fame or fortune or even out for revenge. She's a crusader, a caped crusader in the best tradition. In Batman's tradition. In fact, in Batwoman #0 (2010), the Batman himself narrates his investigation of Batwoman. What's interesting is that Batman, evaluating her for his global crime-fighting network Batman Inc., regards her not as a subordinate as he would one of his Robins or even Batgirl. Batman regarded Batwoman as a peer. He offered her a spot in Batman Inc. as a peer. Then she turned him down. The Batwoman comic series is a joy to read. Written initially by Greg Rucka and now penned by J.H. Williams III and W. Haden Blackman, the series boasts evocative, eye-popping artwork primarily by J.H. Williams III that looks like nothing else in mainstream comics. Most issues contain multiple two-page layouts that read like some kind of twisted Game of Life game board involving the Batwoman facing down psychotics with hooks for hands, enormous mutated crocodile men, and even werewolves. Batwoman's rogues gallery is a gathering of ghastly grotesques. She faces down dead women reborn as wailing water ghosts, murderous shapeshifters, and her primary enemies, the Religion of Crime. Its leader is her thought-dead twin sister Beth Kane, reborn as Alice, her insane mirror image, her own personal Joker of sorts. Just about everything Kate Kane faces is deeply personal. And boy, is Batwoman violent. Gotham City, already the least pleasant locale for a superhero to ply his trade, takes on even more shadowy, terrifying layers for Batwoman. She's stabbed repeatedly, thrown off of buildings, gassed, nearly drowned, and is a hair's breath of being killed several times. As well trained as she is (her origin story, depicted in "Batwoman #0" (2012), includes two years of absolutely brutal military training around the world that would make Bruce Wayne himself raise an eyebrow), and as well-equipped as she is (her arsenal is futuristic, with a bullet proof batsuit and other wonderful toys even Batman doesn't have), Batwoman still gets the hell kicked out of her. Her sometimes-sidekick Flamebird suffers one of the most horrific beatings ever when a villain slices her open with a hook from groin to sternum. Being Batwoman, living in her world, is not a lark. Reading Batwoman is not for the faint of heart. To me, Batwoman is to the current DC Comics New 52 era what The Question, written by Denny O'Neill and drawn by Denys Cowan, was to the 1980s DC Comics. (I can think of no greater compliment to pay it.) Batwoman has that same gritty but honest, questing nature. It's mature comics, at times profound, eloquent, gorgeous, heartbreaking, uplifting. Kate Kane is worth getting to know. Batwoman is worth reading. If there's room for one more Bat in your comic book life, make it this one.